Bemba Arrives in Congo But Can He Run for President? Two months after being acquitted by the Appeals Chamber of the International Criminal Court (ICC), Jean-Pierre Bemba, has arrived home in the Democratic Republic of Congo, where he has indicated intentions to run for president in elections slated for this December. However, it remains to be seen whether the government of President Joseph Kabila will not throw roadblocks in his way or if his impending sentencing at the ICC for witness tampering will affect his prospects. The 55-year-old former vice president of Congo arrived in the capital Kinshasa on Wednesday, August 1, where he was welcomed by large crowds and a heavy police deployment. Bemba had not been to Congo since he fled the country in April 2007 following clashes between government forces and troops loyal to him, primarily drawn from his Movement for the Liberation of Congo (MLC) rebel group, which had been integrated into the national army. At the time, Bemba was a senator and opposition leader. The following year, he was arrested in Belgium on an ICC warrant for crimes allegedly committed by the MLC in the Central African Republic and transferred to the court's detention center in The Hague. Last June, appeals judges acquitted Bemba of war crimes and crimes against humanity after a trial chamber had convicted him in 2016 and handed him an 18-year prison sentence. The acquittal paved the way for his interim release to Belgium. Nonetheless, judges at the court are yet to sentence him for a separate conviction for tampering with witnesses who testified on his behalf. The MLC, which Bemba founded in 1998, and which remains a major opposition party, nominated Bemba as its presidential candidate ahead of his return to the country. According to media reports, Bemba last week told a press conference in Brussels that he favored the formation of a coalition of opposition groups to name a joint presidential candidate. He was further reported as saying that he believed he would be the best candidate to represent the opposition in December's presidential election. Last week, a spokesperson of the ruling coalition said Bemba should be barred from running for president due to his conviction for witness tampering. He cited Article 10 of the Congolese electoral law, which stipulates that a person guilty of corruption is not eligible to stand as a candidate in electoral processes. However, the electoral commission has not given a position on the matter, nor has it been taken to the constitutional court that, in case of a dispute, would make a determination on Bemba's eligibility. At the time Bemba left Congo, the country's attorney general had asked the senate to revoke his immunity, so he could be charged for treason. It is not clear whether any charges related to this could be resurrected. President Joseph Kabila, in power since succeeding his assassinated father in January 2001, is not eligible to stand for re-election because he has served out all terms permissible by the constitution. However, he has not stated categorically that he will not run again. His most recent term expired in 2016, but he has remained in office pending the election, which has previously been postponed due to what electoral officials termed logistical difficulties. Between 1998 and 2003, the MLC, with the assistance of the Ugandan government waged war against the government of Congo. Following a peace agreement, Bemba became one of the country's four vice presidents, serving in this role between July 2003 and December 2006. In the presidential election of August 2006, he emerged second with 20 percent of the vote, second to the incumbent, Kabila, who took 44 percent of the vote. In the run-off between the two, Kabila was announced winner with 58 percent of the vote. In early 2007, Bemba won a senate seat in the capital. However, while Bemba has a loyal base in the country, his decade-long absence has seen a significant slide in the percentage of his party's representation in parliament, with many senior party members decamping. According to poll results released this week by the Congo Research Group based at the Center on International Cooperation at New York University, Bemba had gone up 16 percent since last November, as 83 percent of respondents "thought his acquittal [at the ICC] was a good thing." 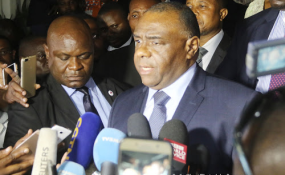 Nonetheless, the poll showed Bemba was trailing fellow opposition contenders Felix Tshisekedi and Moise Katumbi as the favored common opposition candidate. Katumbi fled to exile in 2016 following accusations he planned to overthrow President Kabila but plans to return to Congo this week. Back in 2011, hardly a year after his first trial at the ICC commenced, Bemba wrote to his party officials beseeching them to name him the flag-bearer. Whereas they gave the nod to his request, Bemba was unable to get out of ICC detention to run for president. At the time, his lawyer said the Rome Statute, under which he was being tried, did not bar him from standing for elections. Other than Bemba, the ICC has handled cases of other high profile politicians, notably Kenya's president, Uhuru Kenyatta, and vice president, William Ruto. The two were charged with various crimes against humanity arising from the 2007-2008 post-election violence in the country. Ruto's trial started in September 2013, but the charges were terminated in April 2016. Kenyatta's trial did not take off, and the charges were withdrawn in December 2014. Kenyatta and Ruto, who were erstwhile political rivals, were united by their cases at the ICC, and went on to ride a populist tide against the court to get elected into the two top positions in the Kenyan government. As for Bemba, his fate could lie both with Congolese authorities that may fight his eligibility to run for president and ICC judges who will decide on a prosecution request to send him back to jail to serve time for witness tampering. Read the original article on Bemba Trial Website. Copyright © 2018 Bemba Trial Website. All rights reserved. Distributed by AllAfrica Global Media (allAfrica.com). To contact the copyright holder directly for corrections — or for permission to republish or make other authorized use of this material, click here.